« San Francisco Here I Come! I’m so excited about this release! This story was inspired by the beautiful cover, designed by Sable Grey, and my love of the legend of the Lost Dutchman Mine. I think I heard the original story at my father’s knee, then my interest was piqued from television shows and a young adult mystery I read (sorry I don’t remember the title and it is probably l-o-n-g out of print). 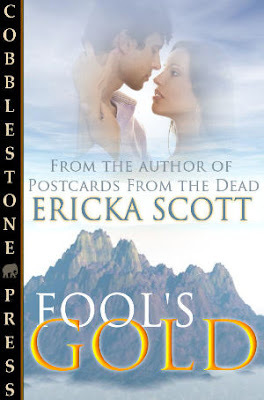 Somehow all that meshed into Rae & Mica’s story…I hope you enjoy the following exclusive excerpt from Fool’s Gold. At noon they stopped next to a small stream to rest the horses and eat. Under normal conditions, Rae would have enjoyed the scenery. The rock walls of the canyon rose high above them, and one or two windblown trees leaned almost to the ground. At the moment, there wasn’t even a breeze, and she was suddenly reminded of Iraq and the silence right before a raid. Sweat coursed down her back, and a fly buzzed next to her ear. She swatted it away and heard a faint musical sound. She tipped her head when she heard it again. It was the echo of water dripping into a subterranean basin. Hawke had dismounted and was busy filling a foldaway water bowl with water for his horse. Rae slid off Sunny and pulled a similar bowl out of her saddlebag. She glared at Marcus and Sue Ellen, who had dismounted and left their horses standing in the hot sun. She grabbed all of their reins and led them to the sparse shade. What in the hell had she been thinking? She’d hoped to lead them close enough to the mine so that she could find it again by herself. And look what had happened. She knew better. Nothing good ever came from greed. It was all just a pipe dream. A dream that could have gotten them all killed. Marcus and Sue Ellen went off hand in hand to explore a nearby cave, giggling like teenagers in love. She could only hope a big old mountain lion had taken refuge in the cave and would scare some sense into them. Jason moaned, and his eyelids fluttered. Rae dumped some of her water into his mouth causing him to gasp. “Well, at least take this for the pain.” Rae poured two pills out of a bottle and offered them to Jason. “Tylenol with codeine. It’ll at least take the edge off.” Rae told him. She should know, for she had to take it herself every so often. Not for the part of her arm left, but for her missing hand. It was called phantom limb pain, and it was excruciating. 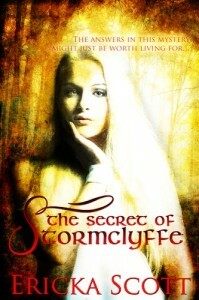 Cramped fingers, a palm that felt as if she’d been clenching her fists so hard her fingernails had dug into the flesh. And pain from an old case of carpal tunnel syndrome would seize the muscles in her wrist. “So, why are you so determined to turn back? Don’t tell me you don’t believe there’s gold. Experts at the museum even said there was.” Jason winced as he shifted his leg. At that moment, Marcus and Sue Ellen rejoined them. “There’s never been any doubt these mountains are rich in minerals. Finding them is easy, it’s getting the gold out. That’s the hard part,” Rae said. “Why is that? You just carry it.” Marcus laughed. Rae wanted to reach out and shake the woman senseless. Rae nearly laughed but covered it with a strangled cough. “Well, we have guns, and I want that gold.” Sue Ellen’s blue eyes narrowed, and Rae had the sudden impression of a pit bull wearing lipstick. God help whichever man ended up with her at the end of this little adventure. “So, let’s go,” Marcus said. “You ready?” Rae looked at Jason. His eyes were dull, and she hoped the pain medication had kicked in enough to allow him to travel in relative comfort. She didn’t even want to think about trying to get him out of the mountains. If the search party found them soon enough, he could be airlifted out. She couldn’t’ worry about it now. Hawke and Marcus lifted Jason back onto the horse, and Hawke used rope to secure the injured man. As they all began to mount their horses, a strange sound echoed off the walls of the canyon. “What the hell?” Marcus said. Rae and Hawke exchanged a long look before she finally answered Marcus’ question. A chill finger of fear crept down her spine. They weren’t alone. Fool’s Gold is dedicated to my partners in crime, D.L. Browne, Mr. Thrilling, and the rest of the gang — may your road to publication be paved with many acceptances. This entry was posted on Monday, January 28th, 2008 at 10:17 am in Blurbs and Promos. You can feed this entry. Responses are currently closed, but you can trackback from your own site.